Upon the culmination of the Olympics in Rio, the Journey to Tokyo for the 2020 Olympics has began in earnest with a cooperation between the Amateur Boxing Association of Kenya (BAK) and the government of South Korea. The cooperation will entail an exchange programme and technical support to BAK through training of coaches, judges and referees by the South Korean government. To jumpstart the cooperation, the South Korean government through its Ministry of Sports donated boxing equipment to BAK for training and use in the local league. 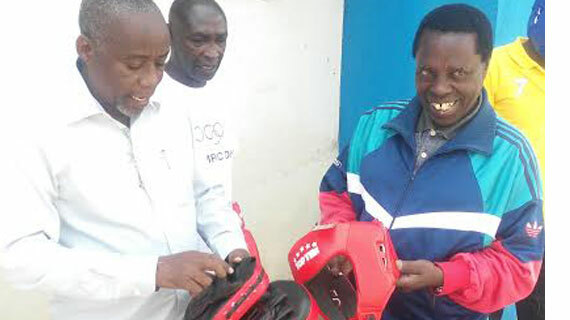 The equipment worth Sh2 million includes head guards, gloves, ring boots, bandages, coaching pads and punching bags. BAK chairman John Kameta paid tribute to the South Korean government for the donation saying it will go along way in ensuring that they are able to tap young talent and an increased number of boxers that will qualify for the 2020 Tokyo Olympics. “We are going to distribute the equipment at the grassroots in the counties to ensure that boxing is active countrywide as we endevour to identify and nurture raw talent,” he said. Kameta said the boxers that represented Kenya at the Rio Olympics may be old to represent the country in Tokyo and that’s why BAK wants to begin on a clean slate by nurturing young talent in readiness for Tokyo. The chairman said BAK programmes towards attaining the 2020 Olympics dream which will include fund raising and popularising the sport through prominent boxers. “We are considering having former undisputed American boxer Mike Tyson or Filipini Senator considered to be one of the greatest boxers of all time Manny Pacquiao to tour the country next year to assist in fund raising and popularizing boxing and arouse interest amongst Kenyans ahead of the 2020 Olympics,” he said. Kameta said BAK was involved in talks with managers of the boxers and details of the deal will be known in due course.